Today was yet another early morning, but we actually met 30 minutes later than usual so that felt nice. Because we ran longer intervals yesterday morning and then did drills in the afternoon, we thought we would do sprinting today. We did the same sprint workout we did a couple weeks ago. You can also find it on our Cardio page called build-up sprints. 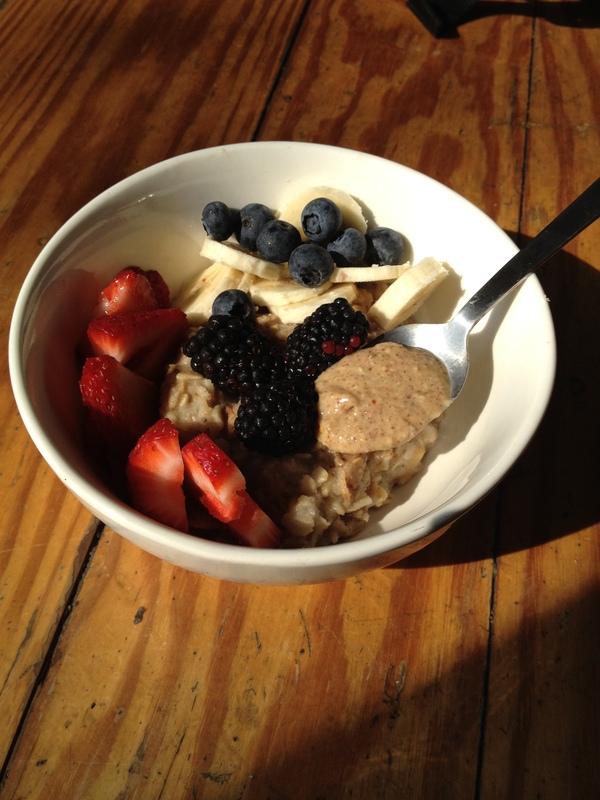 While we know we talk about this almost everyday, we just LOVE oatmeal <3. More often than not, we just cook our oatmeal in the microwave for a few minutes because we are hungry, it is easy, and takes less time. 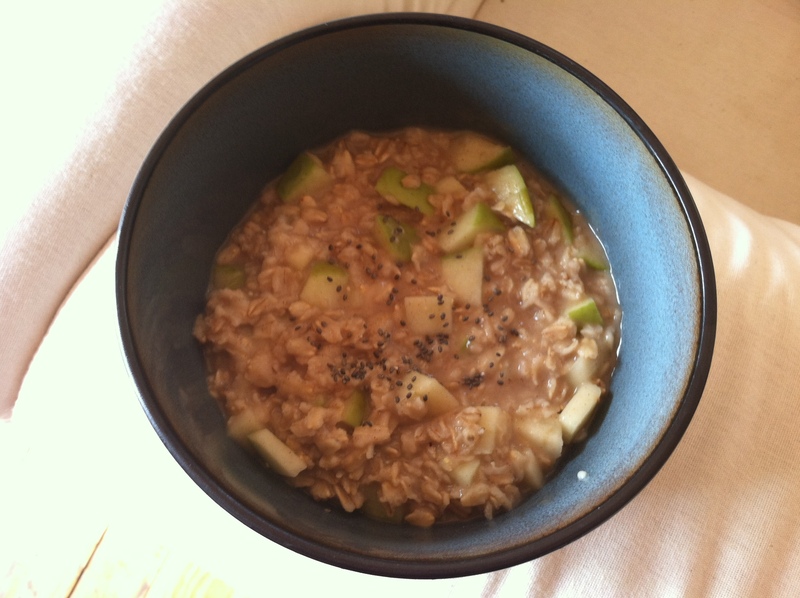 Microwaved oatmeal tastes great, but it does not compare to cooking oatmeal on the stove! We both made oatmeal on the stove this morning. We decided to be a little gourmet and add fruit in the pot as we were cooking our oats. Less decided she wanted to make apple pie oatmeal. She saw this recipe on Pinterest and it looked so good she had to try it! Bring the water to a boil in a small saucepan. 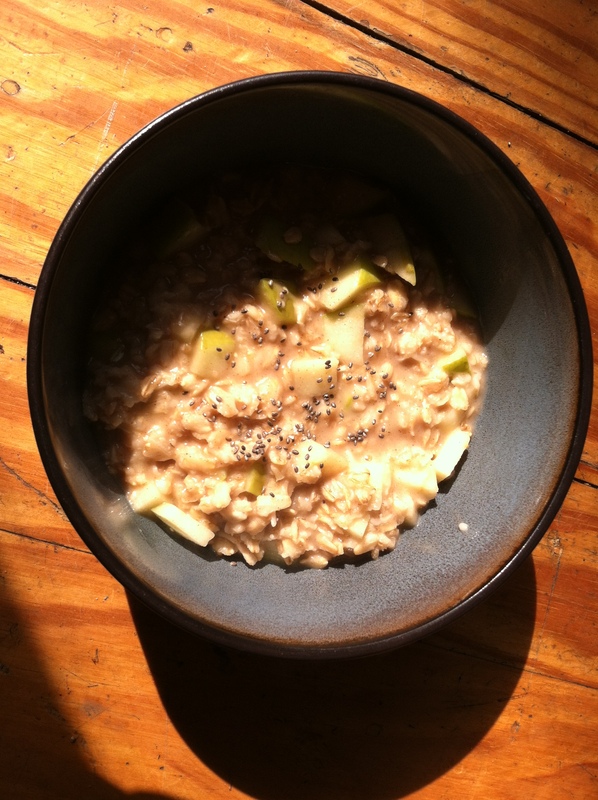 Then add the oats, apple, cinnamon, and nutmeg. The heat gets adjusted to low and the oatmeal is simmered for 2-3 minutes while stirring. That’s all there is to it. Serve it with a splash of milk and a little or a lot of brown sugar sprinkled on top. Jess opted for whipped banana oatmeal! I guess we love our apples and bananas! She followed a recipe from Kath Eats. Start by combining rolled oats, water, and milk in a saucepan over medium heat. Slice a banana into VERY thin pieces, leaving just a few bigger chunks. Walk away for a few minutes while the oatmeal heats. Once it begins to steam or bubble, stir vigorously at times to “whip” the banana into the oats. The oats will take about 5 minutes on medium heat from start to finish to fully absorb the liquid. They’re done when they reach your desired consistency! Then I stir in vanilla (and often pumpkin or cottage cheese) and portion into bowls. Add any toppings you like, such as almond or peanut butter dollops, nuts, granola, coconut, crumbled granola bars, or trail mix – with dark chocolate chips! Or check out all the combos listed below. Jess also used almond milk instead of regular or soy milk. After cooking her oatmeal, she added fresh fruit on top, which included sliced strawberries, blackberries, more banana (! ), and blueberries. She also added a spoonful of almond butter. Less tried Jess’ oatmeal and really enjoyed it! Both oatmeals get a 10 today! On that note, how great was it watching the USA women’s gymnastics team win gold last night? It was so exciting!